The Broads Authority has invested in 30 Schwegler bat boxes which will provide roosting places for the uncommon bat species, Nathusius’ pipistrelle (4th February 2019). 2017 is the first year that Norwich Bat Group has joined the National Nathusius’ Pipistrelle Project run by The Bat Conservation Trust. The project has already revealed important information about this species by trapping and ringing to identify individuals. It has been discovered that, as well as being a resident species in the UK, Nathusius’ pipistrelle also migrates between north east European countries such as Latvia and Lithuania and the UK. This summer, Norwich Bat Group trapped and ringed Nathusius’ pipistrelle at eight separate locations across the Broads National Park and two other sites in North Norfolk. The trapping methods do not harm the bats and they are released immediately after confirming identify, weighing, measuring and ringing with a unique ring number. A total of thirty two trapping sessions have been carried out by twenty two dedicated volunteers and fifty two Nathusius’ pipistrelles have been ringed in The Broads, thirteen at Whitlingham. Essex and Bedfordshire Bat Groups joined Norwich Bat Group to help on two evenings . 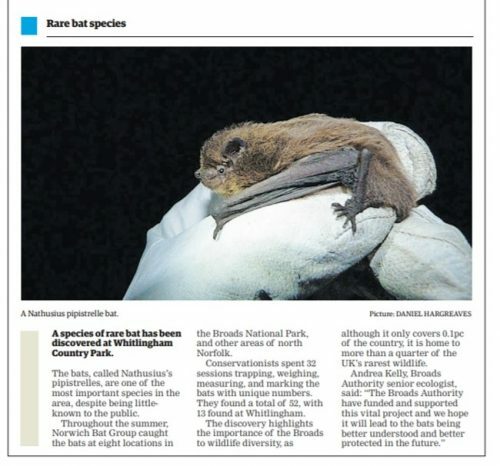 The numbers of this rare bat discovered in the Broads, and particularly at Whitlingham, supports the staggering Broads National Park statistic that although they only cover 0.1% of the country, they are responsible for more than a quarter of its rarest and most significant wildlife. Each year, Norwich Bat Group and other bat groups around the country will be sending their results to the National Nathusius’ Pipistrelle Project. The combined data will develop a more comprehensive understanding of this enigmatic migratory bat which is needed for the long-term conservation of populations of this species. The Norwich Bat Group was formed in 2007 and works to help protect, conserve and raise the awareness of bats in Norwich and the surrounding area. Of the approximately 17 resident species of bat found in Britain, at least ten species have been recorded in and around Norwich. Promoting awareness of bats to the general public includes leading guided bat activity walks, training volunteers for the National Bat Monitoring Program and participating in wildlife events. Protecting and conserving bats also includes finding new roosts, gathering new records of bats and monitoring known bat roosts and feeding areas. The group is affiliated to the Bat Conservation Trust, the national voice for bats in Britain. The National Nathusius’ Pipistrelle Project was launched in 2014 with a grant from the People’s Trust for Endangered Species, to improve our understanding of the ecology, current status and conservation threats for Nathusius’ pipistrelles in Great Britain. Determine the resident and breeding status of Nathusius’ pipistrelle in Great Britain. Determine the migratory origins of Nathusius’ pipistrelles in Great Britain.